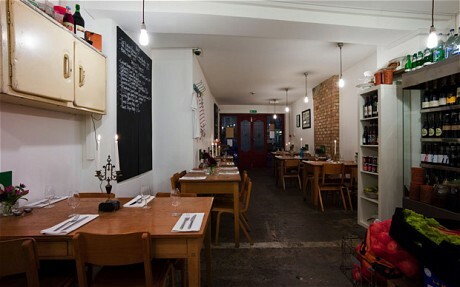 I must admit I was put off going to Dalston restaurant A Little Of What You Fancy after I looked it up online and discovered Time Out London described it it as “managing a fine balance between East London cool and middle-class tweeness”. That in itself is enough to make anyone not from East London run a mile, surely? As someone who has never been an East London dweller, I’m always wary about heading to restaurants and bars in the Hackney area. As good as they may be, as an ‘outsider’ you never feel that welcome. I’m always self-conscious that my jumper’s not baggy enough or I’m wearing the wrong sort of footwear. So when I was invited to A Little Of What You Fancy for a friend’s birthday brunch I felt slightly apprehensive about it and imagined I’d be sharing my Sunday lunchtime with a tribe of vintage-clad young hipsters and middle aged folk wishing they were still young hipsters. But maybe Sundays are the best day to head East because hipsters sleep late, or perhaps because it was Mother’s Day there were more families which balanced things out a little… Whatever the reason, A Little Of What You Fancy didn’t seem a hot bed of East end cool, which for me was a good thing. 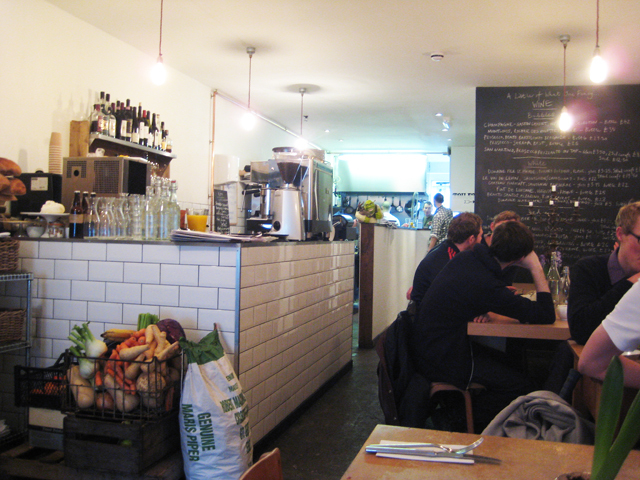 It was a very friendly, relaxed atmosphere, not at all pretentious, aided by the decor which was stripped back and a little rough round the edges. There’s no sign above the door, only a chalkboard with the name written on it, so you have to know what number it is. It felt quite basic and a little down at heel, but in a good way, like it had been there far longer than the two years it has been open. Vintage wooden school chairs and old wooden tables added to the comfortably worn-in look. The food was decent, nothing out of this world but I don’t think anyone had any real complaints either. We were part of a big group, I think there were 14 of us, so there could have potentially been a lot of mistakes. I had scrambled eggs, roast tomato and chorizo on toasted sourdough bread, and there was plenty of chorizo. Not Brindisa standard but good all the same. The scrambled eggs were cooked perfectly and I felt pretty full when I finished, which is important in my books. And at £8.50 I thought it was well priced. They had however run out of black pudding which a couple of people grumbled about. And they did momentarily run out of tomato juice which meant no Bloody Mary’s, but they quickly restocked and all was well again. Sunday brunch-time is probably the time you want to stock up on black pudding and tomato juice, so that was a slight oversight of the chef or manager. 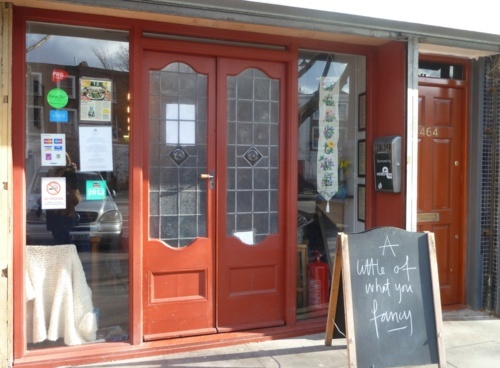 The waiting staff got also a bit muddled with the drinks orders at times, but generally service was good and staff were friendly, which for me is what matters. Overall I would definitely recommend eating here if you’re in the area, particularly for brunch which is perhaps more of a laid back time to eat out anyway. I’d be interested to see how it delivers in the evening when prices look a fair bit higher and meals sound more ambitious. It’s possibly not worth a special trip, but if you don’t live in East London and you fancy a change of scenery on a Sunday, don’t let the location put you off.